Following the attack on Villers-Bocage on 13th June 1944, Michael Wittmann was recommended for the award of the Oakleaves with Swords (Eichenlaub mit Schwertern) to his Knight’s Cross. The crossed swords were not presented as one single piece of jewellery, but came with the Oakleaves that already would have been presented to the award’s recipient. 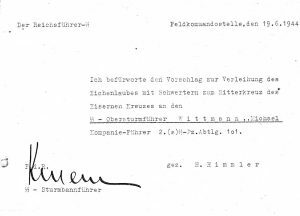 This document is a copy of the memorandum on behalf of Reichsführer-SS Heinrich Himmler, sent six days after Wittmann’s famous attack. Official confirmation of the award would arrive three days later. 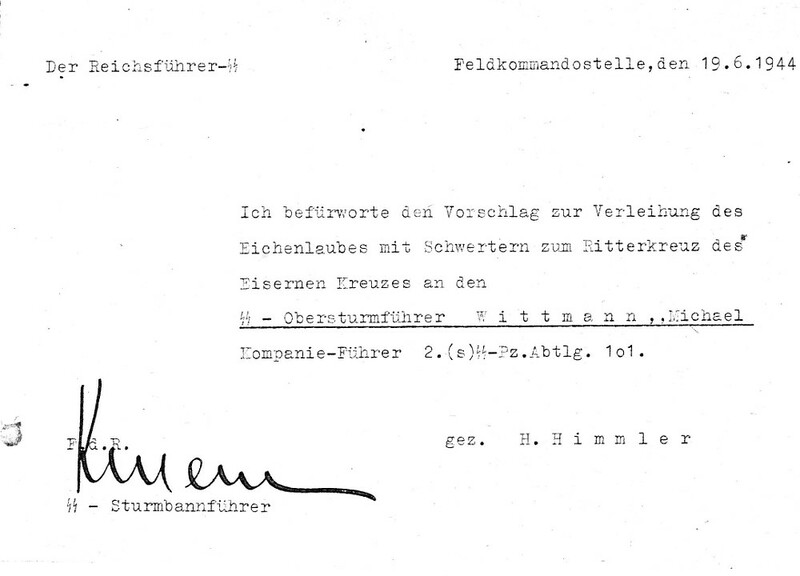 As with most correspondence dealing with awards to Waffen-SS personnel, it is typed and hand-signed in ink by Himmler’s liaison officer, SS-Sturmbannführer Wilhelm Kment. The typewriter used is an SS issue, with the special “SS” key. I am in favor of the suggestion to award the Oakleaves with Swords to the Knight’s Cross of the Iron Cross to SS-Obersturmführer Wittmann, Michael. Company Leader 2nd (Heavy) SS Panzer Battalion 101.